Premier Michael Dunkley and his Ministerial Colleagues conducted today’s [May 9] weekly Cabinet meeting at The National Museum of Bermuda in Dockyard. “The Cabinet Office on Front Street has been undergoing extensive renovations and since the start of the refurbishment project, the Ministry of ‎Finance has served as the alternative location for the weekly Cabinet meetings,” a spokesperson said. “However, Premier Dunkley has hosted some of the meetings at the west and east ends of the Island, as the he views this as an opportunity to extend the Ministerial outreach and engagement into the community. “Starting off the day, today, Premier Dunkley, Ministers and the Cabinet Secretary, Dr Derrick Binns, joined commuters in travelling to Dockyard via ferry. 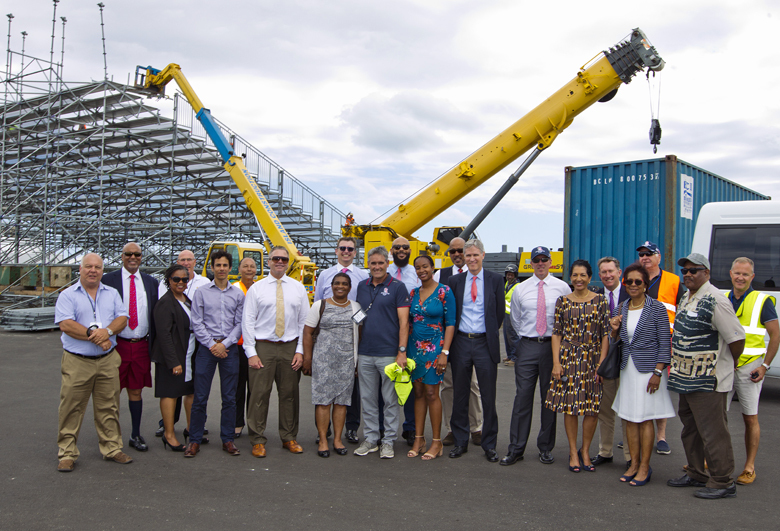 “During the lunch break the Premier, Ministers and his colleagues enjoyed lunch at the Dockyard Pastry Shop with Wedco Chair Ray Charlton and GM Andrew Dias who updated them on the work that has been conducted by Wedco. 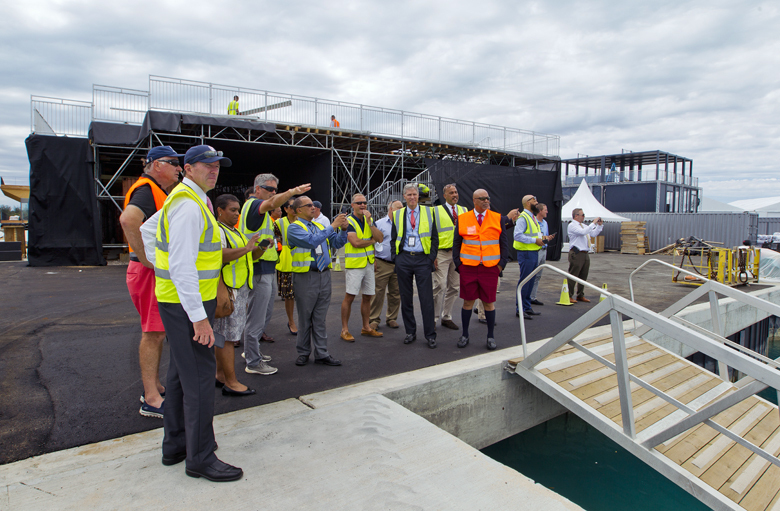 They also conducted a site visit of the America’s Cup Event Village with Sir Russell Coutts, Peter Durhager and Michael Winfield. In addition Minister of Social Development and Sport Nandi Outerbridge remarked, ” The tour of the event village 17 days before the opening races has heightened our excitement for AC35. “I was impressed by the hospitality facilities being erected by ACEA. 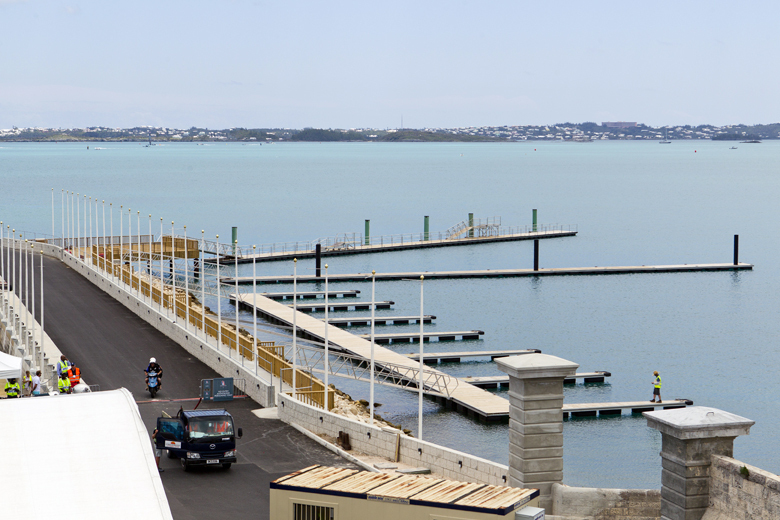 These include Club AC, the Longtail Lounge VIP Hospitality, the Grandstand Seating and the Goslings Dark’n Stormy Island Bar which all have direct viewing sight of the race course. The village center boasts an impressive Kids Zone which is near completion. Love the subtle photo of them posing in front of an Island Construction crane. PLP MP Desilva won’t turn away a dollar! More like a field trip, take advantage cause you will soon be out. Well thats if my people dont get dupped again. Did they sneak in at 5:00 am again? HA HA HA, HO HO HO!!! You made a funny. Well, you made a very poor attempt at trying. It really is tough for you to accept that the OBA is doing so well isn’t it? Er no, they caught the ferry….Stop trying to be funny or controversial – it isn’t working. No need. Your shepherd hadn’t instructed you to be there. Baaaaaaaaaa!!!!!! Can’t wait till he calls the election . 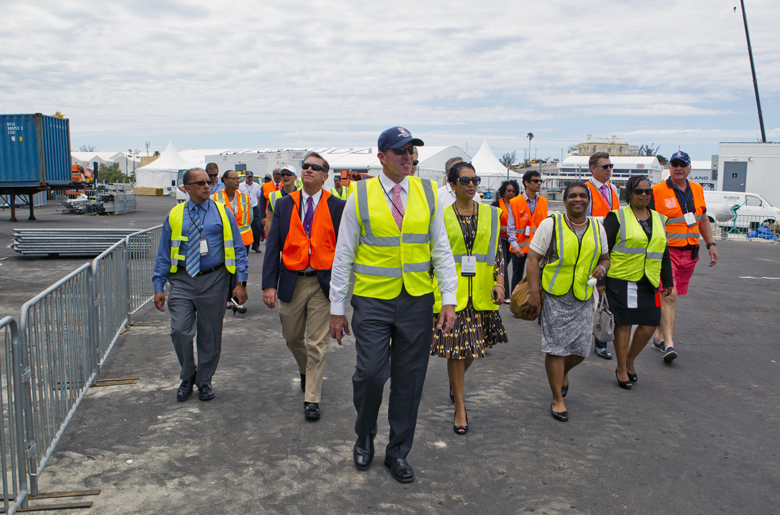 Uh – PLP supporters – look at the work being done by Bermudians – please don’t cut your noses off to spite your faces!